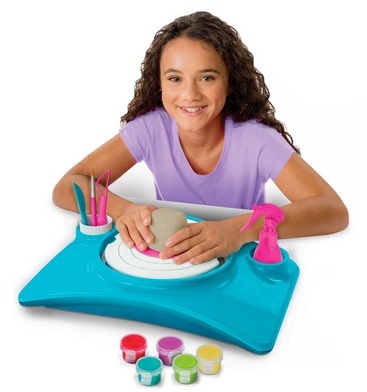 Easily sculpt endless possibilities with the Pottery Cool Clay Studio! This innovative studio makes crafting and designing clay projects incredibly easy and fun for kids to do. Pottery Cool has turned pottery upside down – simply place a clay disk onto the turntable, gently spray it with water and watch it spin and take shape in your hands. Pottery Cool Clay Studio’s unique design helps you create perfectly shaped pottery by letting gravity do the work for you. And once air-dried, the creativity really begins! With multiple sculpting tools and 10 brightly coloured metallic paints, you can quickly customize each creation for a truly unique look. It’s pottery made easy! The Pottery Cool Clay Studio comes with everything you need to start right away. Create 6 beautiful projects, including: A Jewelry Holder, Puppy Picture Holder, Turtle Dish, Smart Phone Speaker, Cupcake Pencil Holder and Pencil Topper. Discover a whole new way to create with clay with the Pottery Cool Clay Studio! 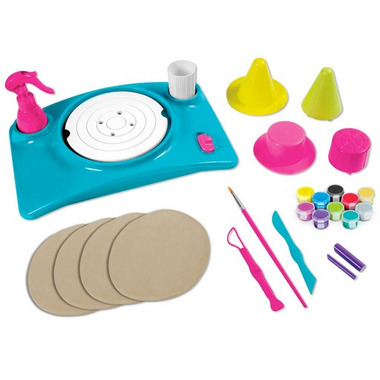 Easily sculpt, design, paint and display custom clay creations with the Pottery Cool Clay Studio. It’s a whole new way to create with clay! Includes everything you need to create 6 projects, including: Jewelry Holder, Smart Phone Speaker, Pencil Holder and more. Customize your clay using unique sculpting tools and 10 brightly coloured metallic paints. 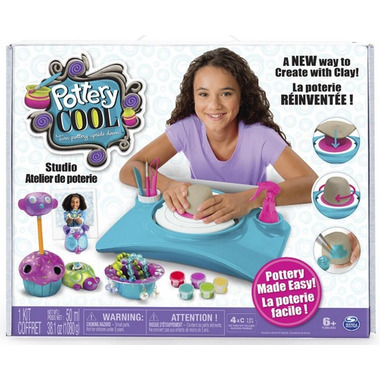 The Pottery Cool Clay Studio is for ages 6+ and requires 4 C batteries (not included). Additional clay refills and project kits sold separately.